At 7:00 am on Wednesday, July 26, California Interagency Incident Management Team 3 (CIIMT3) will transition command of the Whittier Fire to a local incident management team. No significant fire activity is expected today. There are still isolated pockets of heat and unburned islands within the fire perimeter, but no forward progression is likely. Crews are continuing work in the front country to construct and improve fire line. Personnel are working on patrol, mop-up and suppression repair. Approximately 40 miles of dozer line and roads have been repaired. The Burned Area Emergency Response (BAER) Team is evaluating the burned area watersheds to identify emergency treatments necessary to protect sensitive resources. No significant fire activity is expected today. There are still some isolated pockets of heat and unburned islands within the fire perimeter, but no forward progression is likely. Personnel are working on patrol, mop-up and suppression repair throughout the fire area. Repairs include backhaul of equipment and construction of water bars for erosion control on dozer lines and roads. Crews continue working in the front country to construct and improve fire line. The Burned Area Emergency Response (BAER) Team has begun their assessment. The team will evaluate the burned area watersheds and identify emergency treatments necessary to protect sensitive resources. No significant fire activity is expected today. There are still some isolated pockets of heat and unburned islands within the fire perimeter, but no forward progression is likely. Last night was the last shift of night operations. High pressure will weaken today and move to the east as an area of low pressure moves to a position off the northern California coast. This will bring monsoon moisture into the region tonight and Monday. There will be a small chance of thunderstorms Monday and Tuesday as the moisture lingers. In the lower levels, on shore flow will increase and the marine layer will deepen. This will allow for cooling over the entire area Monday and Tuesday. Crews are continuing work in the front country to construct and improve fire line. Personnel are also working on patrol, mop-up and suppression repair throughout the fire area. Repairs include backhaul of equipment and construction of water bars for erosion control. The Burned Area Emergency Response (BAER) Team will begin their assessment this week. The team will evaluate the burned area watersheds and identify emergency treatments necessary to protect sensitive resources. At 87% containment, there should be minimal fire activity today. Within the perimeter of the burn area, there may be some smoldering and creeping fire behavior, but no forward progression is expected. High pressure aloft will remain over the fire area Saturday and then weaken and move east on Sunday. Over the weekend, little change in temperature and humidity trends is expected. On Sunday, low pressure will develop off the Northwest California coast, bringing moisture from northern Mexico and the Gulf of California into the area. There is a slight chance of thunderstorms on Sunday night and Monday. Crews are continuing work in the front country to construct direct fire line. On all other sections of the fire, personnel are working on patrol, mop-up and suppression repair. Repairs include backhaul of equipment and construction of water bars for erosion control. The Burned Area Emergency Response (BAER) Team will begin their assessment early next week. This team will evaluate the burned area watersheds and identify emergency treatments necessary to protect sensitive resources. As containment increases, some crews and equipment are being reassigned to other fires. The Whittier Fire is now 83% contained at 18,430 acres. Minimal fire activity is expected today. Visible fire last night was well within the perimeter, near Condor Peak. Fire may be seen again tonight within the burn area. Interior islands may continue to burn today, but no forward progression is likely to occur. Crews are continuing work in the front country to construct direct fire line. On all other sections of the fire, personnel are working on patrol, mop up and suppression repair. Repairs include backhaul of equipment and construction of water bars for erosion control. As Whittier Fire activity winds down, some fire assets are being reassigned to other fires. It is early in the fire season; all residents in the evacuation warning area should remain vigilant and prepared. The fire is currently burning in the Santa Ynez Mountains in local, federal and state responsibility areas south of Lake Cachuma. Fire activity may be visible along the southern slopes this evening as winds pick up. Mild sundowners are expected, and although the fire may be active tonight, it is not expected to advance. Several hotshot crews are camped on the fireline to allow easier access. Bulldozers will also be constructing containment line in the front country. Firefighters on the north and west sides will reinforce containment lines by patrolling and mopping up as safe to do so. No heat has been detected on the northern edge of the fire near Lake Cachuma. On the eastern edge of the fire, there is interior heat that may create visible smoke with evening winds. The Whittier Fire is now 76% contained at 18,430 acres. On the eastern and western edges of the fire, no forward fire progression is expected. Interior islands will continue to burn and rollout, hot material rolling across the line, could challenge containment. Along the front country, the fire continues to be in a backing alignment, moving slowly downslope. Grass will continue to be the primary carrier of the fire as grass fuel loads are three times their average this season. Minimal fire spread is expected in the next 24 hours. Along the containment lines, crews are continuing to work on mop-up and suppression repair. Resource Advisors are in place to map and protect sensitive natural and cultural resources within the areas affected by the fire. All equipment that is no longer needed is being retrieved, cleaned, and refurbished for use on future incidents. The Burned Area Emergency Response (BAER) Team will be here next week to begin their work. As Whittier Fire activity winds down, some fire assets are being reassigned to other fires. It is early in the fire season, so all residents should remain vigilant and prepared. The Whittier Fire is now 75% contained at 18,395 acres. From the communities northwest of the fire, light smoke was visible yesterday. On the western edge, fire crews increased containment yesterday and overnight. The fire is creeping slowly downhill, with firefighters attacking the fire head on where safe to do so using targeted water drops on hotspots. Construction of primary and secondary bulldozer line continues. The northern edge is in patrol and mop-up as lines continues to hold with suppression repair beginning. On the eastern edge, fire crews are working to improve the containment line in Bear Creek Canyon. Along the southern edge, the fire grew approximately sixty acres yesterday. Firefighters will continue constructing line as the heavy marine layer slows the fire’s progression downslope. Where safe to do so, fire crews will construct direct fireline; however, where steep and inaccessible, fire retardant will be put via aircraft to further slow the fire’s spread. Water-dropping helicopters and fixed-wing air tankers are supporting crews as needed to help cool hot spots. Evacuation Orders: West Camino Cielo from the Winchester Gun Club to Refugio Road. Evacuation Warning: Cachuma Village; Calle Real north to West Camino Cielo; from Winchester Canyon Road on the east to El Capitan Ranch Road on the west; this includes all roads and trails within the area of the order. Dry and warm air will remain over the region today. A slight cooling trend will continue, with winds over the peaks coming from the northwest to north direction. Calle Real north to West Camino Cielo, from Winchester Canyon Road on the east, to El Capitan Ranch Road on the west. This includes all roads and trails within the area of the order. Wagon Wheel, Winchester Commons and Langlo Ranch Road are NOT in the Evacuation Warning area. West Camino Cielo, from Winchester Gun Club on the east side, to Refugio Road on the west side. The Whittier Fire will continue to smolder for some time. These “smokers” are well inside the perimeter of the burn and do not pose a threat to the fireline. On the western edge, fire showed little activity overnight and is creeping slowly downhill with firefighters attacking the fire head on where safe to do so. Construction of primary and secondary bulldozer line continues. The northern edge is in patrol and mop-up as lines continue to hold with suppression repair beginning. On the eastern edge, fire crews completed a containment line in Bear Creek Canyon, preventing the fire from crossing the creek. Along the southern edge, firefighters are constructing line as the heavy marine layer slows the fire’s progression downslope. Where safe to do so, fire crews will fight the fire direct, however where steep and inaccessible, fire retardant will be put via aircraft to further slow the fire’s spread. Water-dropping helicopters and fixed-wing air tankers are supporting crews as needed to help cool hot spots. Above the marine layer, expect active fire behavior; below the marine layer, minimal fire spread is expected due to high humidity. The Whittier Fire is now 62% contained at 18,311 acres. Crews working on the eastern perimeter completed a containment line in Bear Creek Canyon, preventing the fire from crossing the creek. The fire continues backing down slope on the western and southern perimeters. The northern perimeter is transitioning to patrol and mop-up. Crews on the eastern perimeter are using bulldozers and hand-crews to build line and construct contingency lines. The southern perimeter is backing and is heavily influenced by the marine layer. Above the marine layer, expect active fire behavior; below the marine layer, minimal fire spread is expected due to high humidity. Fifteen water-dropping helicopters and four fixed-wing air tankers are supporting crews as needed to help cool hot spots. The Whittier Fire is still 49% contained at 18,311 acres. SR-154 is still open and some evacuation orders have been reduced. The fire is smoldering on the northern flank. On the eastern and western sides of the fire, expect some flanking runs as the main fire backs into drainage bottoms and aligns with slopes. Tactical firing operations may be used to eliminate unburned fuels near containment lines. The eastern side of the fire is established in the bottom of Bear Creek; however, the fire has not crossed the creek. Structure defense crews are in place at the Cold Springs Tavern which remains in the Mandatory Evacuation Order. Fire is backing down the southern slopes of the Santa Ynez Mountains. Helicopters and fixed-wing air tankers are supporting ground crews as needed to help cool hot spots. 154 to the first river crossing; and Cachuma Village. All other evacuation orders are in effect. The threat level on the east side of the fire has been reduced significantly. With conditions improving, the changes listed below are effective immediately. Fire restrictions have been implemented and a Forest Closure Order is in effect in the area of the fire. For more specific information go to Los Padres Forest website Alerts and Notices or call the Los Padres National Forest at (805) 968-6640. Please be aware that firefighters and fire equipment are working in the area. Drive with caution and be mindful of the possibility of encountering oncoming traffic on narrow, winding roads. 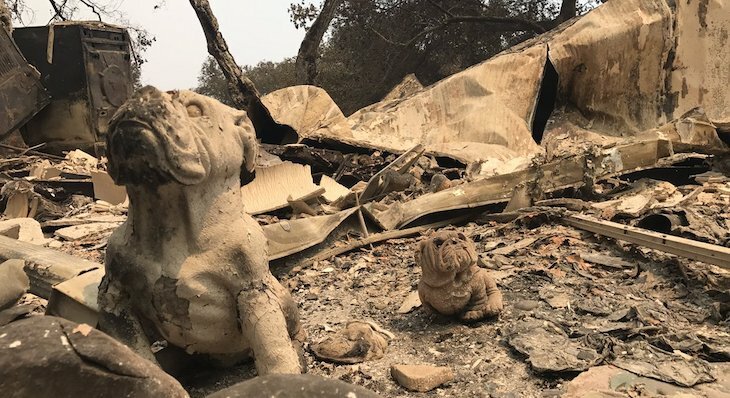 Area residents who need assistance returning large animals to their properties are requested to call the Animal Services Hotline: (805) 681-4332. The Whittier Fire is 49% contained at 18,015 acres. SR-154 is now open and some evacuation orders have been reduced. Santa Barbara County also proclaimed a local emergency due to the Whittier and Alamo fires. A total of 46 structures have been destroyed, 16 residences and 30 outbuildings, as well as 6 additional outbuildings and 1 residence damaged. The following evacuation orders have been reduced to evacuation warnings: Paradise Road from Highway 154 to the first river crossing; and Cachuma Village. All other evacuation orders are in effect (see below). The fire is creeping downslope on the southern, eastern and western perimeters of the fire. Crews completed a few small tactical firing operation to eliminate unburned fuels near containment lines. The eastern side of the fire is established in Bear Creek and crews are working to keep it on the western side of the canyon. The western perimeter of the fire is backing into established containment lines. Helicopters and fixed-wing air tankers are supporting ground crews as needed to help cool hot spots. Damage assessment teams using new software technology have updated the number of structures damaged or destroyed during the early hours of the fire. The Whittier Fire incident management team would like to commend the damage assessment efforts of the Santa Barbara County Office of Emergency Management with regard to their efficient and ongoing operations. Dry and warm air will remain over the region today and Monday with temperatures and humidity trends showing little change over the mountains. The coastal section of the fire will see increasing onshore winds allowing some cooling on Monday and Tuesday. Temperatures near Santa Ynez peak are expected to reach 79. Mandatory Evacuations: West Camino Cielo at Highway 154 to Winchester Gun Club and Kinevan Road; Rosario Park and all of Stagecoach Road; All of Winchester Canyon Road excluding the community of Wagon Wheel, Langlo Ranch Road and Winchester Commons, west to El Capitan ranch road; Calle Real north to West Camino Cielo, from Winchester Canyon Road on the east to El Capitan Ranch Road on the west. This includes all roads and trails within the area of the order. Evacuation Shelters: The American Red Cross has opened evacuation shelters at San Marcos High School, 4750 Hollister Ave., Goleta. The Santa Ynez shelter is prepared to open if necessary. The Whittier Fire has burned 18,015 acres and is at 36% containment. 1,924 personnel are working the incident. Dry and warm air will remain over the region today and Monday with temperatures and humidity trends showing little change over the mountains. The coastal section of the fire will see increasing onshore winds allowing some cooling on Monday and Tuesday. Temperatures near Santa Ynez peak are expected to reach 101. The fire continues to creep down slope on the eastern, western and southern edges of the fire. Firefighters expect flanking runs and some short intense burning as the fire backs into drainage bottoms and aligns with slopes. The eastern side of the fire is established in Bear Creek so expect slope driven runs if it crosses the drainage. The western side of the fire should continue backing into developed containment lines and the Sherpa fire scar. Air attack continues today to support ground crews and to knock down hot spots. Warmer temperatures, lower humidity and winds will increase fire activity as the day progresses. No changes have been made to evacuation orders or warnings since Friday. The air quality warning remains in effect. The most updated information on the fire can be found here: https://inciweb.nwcg.gov/ or www.countyofsb.org. Sundowner winds are in the forecast tonight and have the possibility of extending the southern edge of the fire into the foothills. Throughout the day, the fire continued to creep down slope on the eastern, western and southern edges of the fire. Crews working on the eastern edge of the fire are working to keep the fire from reaching Bear Creek. The southwestern corner of the fire burned into the Sherpa fire (2016) burn area and stalled out due to lack of fuels. Air attack continued today to support ground crews and to knock down hot spots. Warmer temperatures, lower humidity and winds will increase fire activity tonight. The Sundowner winds forecasted for this evening will be slightly stronger than last night’s winds. These winds have the possibility of pushing the fire towards populated areas above Goleta. Should the Sundowner winds develop tonight, gusts are predicted to reach 35 mph. The marine level is expected to be 400 feet lower than yesterday. Tonight it will be warmer and dryer. Mandatory Evacuations: Highway 154 from Armour Ranch (west side) to Paradise Road (east side), West Camino Cielo at Highway 154 to Winchester Gun Club, Kinevan Road. All of Winchester Canyon Road excluding the community of Wagon Wheel, Langlo Ranch Road and Winchester Commons west to El Capitan Ranch Road. Calle Real north to West Camino Cielo from Winchester Canyon Rd on the east to El Capitan Ranch Road on the west. Paradise Canyon Road from Highway 154 east to the first river crossing. Rosario Park and all of Stagecoach Road. Clarification: Farren Road and Las Varas Canyon Road are included in the Evacuation Order area issued today. The Whittier Fire has been burning near Goleta for the last week and continues to be a threat to our community. The safety of lives and property remains a priority. 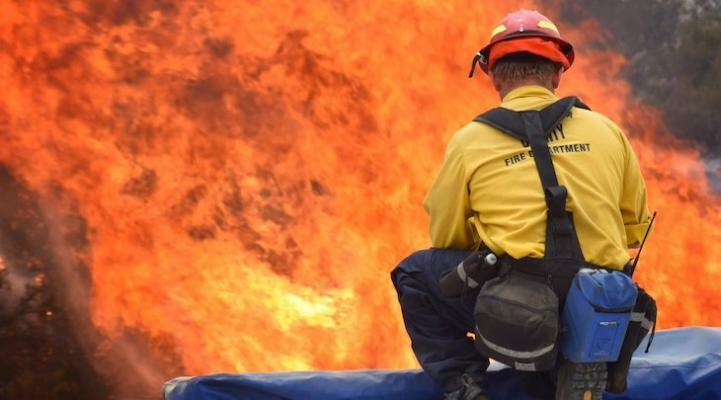 The City of Goleta wanted to provide you with an update on today’s conditions and the best way to receive timely information on the status of the fire. Today, Saturday, July 15, the fire is expected to ramp up in the afternoon as temperatures and winds increase. Sundowners are still in the forecast and may come down lower than last night. No changes have been made to evacuation orders or warnings since yesterday afternoon. The air quality warning remains in effect. The best way to get timely information on the fire status, conditions and evacuation warnings and orders and other emergency-related topics is to visit the incident information website at https://inciweb.nwcg.gov/. You can find the link on the top of our website at www.cityofgoleta.org. The County of Santa Barbara is also posting regular updates and you can find them at www.countyofsb.org. The City of Goleta is posting on social media and on our website at www.cityofgoleta.org. We encourage you to sign up for email and text notifications on our website or by texting Goleta Emergency to 468211. You can also email pio@cityofgoleta.org with your phone number and/or email address and we'll register you. Please indicate if you’d like phone, text or email messages – or all three. If you prefer to speak to someone by phone, you can call 211 and receive information 24 hours/day. Again, just dial 2-1-1. Thank you for your support of emergency personnel during this incident. Be safe. The Whittier Fire has decreased in containment to 35% and grew to 17,364 acres. On Friday morning the fire was estimated to be 52% contained at 13,199 acres, a significant jump took place on Friday evening and early Saturday morning. All of Winchester Canyon Road excluding the community of Wagon Wheel, Langlo Ranch Road and Winchester Commons west to El Capitan Ranch Road. Calle Real north to West Camino Cielo from Winchester Canyon Rd on the east to El Capitan Ranch Road on the west. Existing evacuation orders remain in effect for Highway 154 from Armour Ranch to Paradise Road, Camino Cielo from the Winchester Gun Club east to Highway 154, and Kinevan Road. All campgrounds off Highway 154 are evacuated. Hwy 154 is closed until further notice from Highway 246 to Foothill/Cathedral Oaks, as are several other roads. View the full list of road closures. Fire behavior has increased on three sides of the fire burning above the community of Goleta and new evacuation orders are in place. The east and west portions of the fire experienced flanking and spotting fire activity. The southern flank of the fire had an active head fire with mid‐range spotting. The north side of the fire was predominately smoldering. Crews continue to increase containment by building direct lines and reinforcing bulldozer lines on the east and west edges of the fire. Crews are using a machine called a masticator that crushes and grinds vegetation to remove the large amounts of dead fuel from a multi‐year drought. The fire is burning in an area above the community of Goleta that has not burned since 1955. Approximately 2,700 people are currently evacuated. 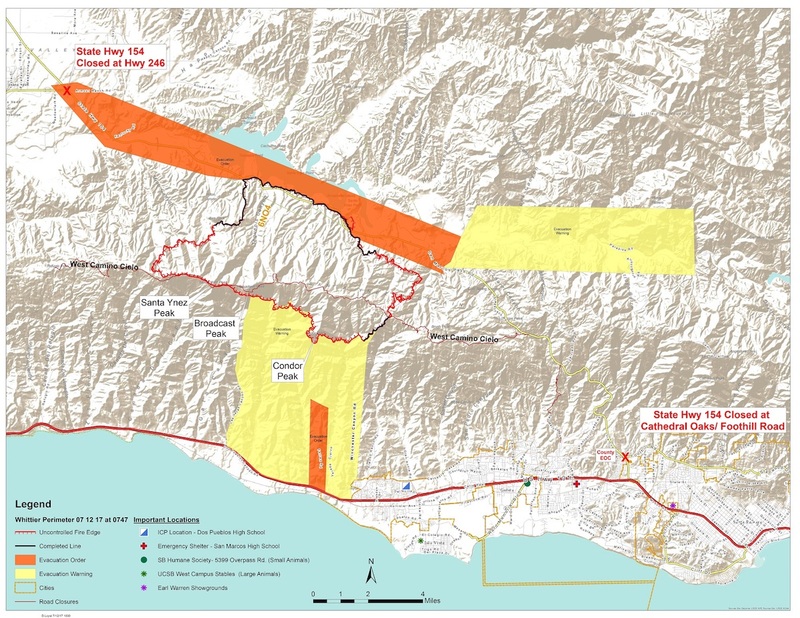 Under the advice of Whittier Fire Incident Commanders, the Santa Barbara County Sheriff’s office has issued an additional Evacuation Order for areas in the Santa Barbara front Country. Paradise Canyon Road from Highway 154 east to the first river crossing. Rosario Park and all of Stagecoach Road. Clarification: Farren Road and Las Varas Canyon Road are included in the Evacuation Order area issued today. The weather pattern is changing and the fire, burning actively, is highly visible in many areas. There are several reports of motorists stopping on roads and highways to view the fire. The increased traffic on Highway 101 due to the closure of Highway 154 and the slowing due to motorists looking at the fire is causing significant delays. Please avoid northbound Highway 101 if possible. The American Red Cross is operating an evacuation center located at San Marcos High School, 4750 Hollister Avenue, Goleta, CA. This center will accept small pets for those who are residing there. The Santa Barbara Humane Society is also available to assist evacuees with small animals. For large animal evacuations, call the Animal Services Hotline (805) 681-4332. Large animals are being accepted at Earl Warren Show Grounds. Coordinate through the hotline. Two additional phone lines have been added to the information center. The Fire Information Center can be reached at: (805) 562-1236, (805) 562-1237 or (805) 699-6451. The Whittier Fire is at 52% containment and 13,199 acres burned. Firefighters preparing for potential sundowner winds Friday afternoon. Residents nearest Goleta foothills should stay aware and be prepared. Fire behavior increased last night. The fire burned into Gato and Dos Pueblos canyons on the coastal side of the Santa Ynez Mountains. Crews continue to increase containment by building direct lines and reinforcing bulldozer lines on the east and west edges of the fire. Contingency lines are being built should the fire cross primary lines. Two additional firefighters suffered heat related injuries, bringing the total of injured firefighters to five. All injured firefighters have returned to work. Weather is a concern for today and tomorrow, the marine layer is lifting and the temperatures are rising. Lower relative humidity and Sundowners are forecast for today and Saturday. Wind gusts are forecast to reach up to 30 mph should the Sundowners develop. These changes in the weather pattern will increase fire activity this afternoon and evening. Santa Barbara APCD has issued a Health Warning for smoke and ash for the entire county remaining in effect through Monday. Additional firefighting resources arrived yesterday and are being deployed. More crews and equipment have been ordered and are en route to the fire. Evacuation orders remain in effect for Highway 154 from Armour Ranch to Paradise Road. All campgrounds off Highway 154 are evacuated. Hwy 154 is closed until further notice from Highway 246 to Foothill/Cathedral Oaks. Old San Marcos Road is closed between Hwy 154 and Via Parva. West Camino Cielo from Refugio Road east to the fire is closed. The Evacuation Order for Farren Road to Winchester Canyon in the Goleta area was downgraded this morning to an Evacuation Warning. Only residents served by Farren Road will be allowed through the barricades. An Evacuation Warning is in place for Las Varas Canyon east to Winchester Canyon and from Highway 101 North to W. Camino Cielo; and Paradise Road from Hwy 154 to the first river crossing. Law enforcement is patrolling the evacuation areas, and as soon as it is safe, we will communicate how and when people can re-enter the area to retrieve personal items left behind during the evacuation. For public and media inquiries, call 805-699-6451. For campers who had to evacuate Cachuma Lake Recreation, County Parks is coordinating when and how personal belongings can be returned. Please call Parks' call center at 805-568-2460. Residents nearest the foothills of Goleta will begin to see a buildup of firefighting equipment as firefighters prepare for the potential sundowner winds Friday afternoon. If sundowner winds do occur, residents need to prepare to follow directions from emergency management officials. Follow Ready, Set, Go principles! The Whittier Fire is currently 52% contained at 12,263 acres. Active fire behavior continued today but firelines kept the fire in check. Crews continued building direct lines, reinforcing dozer lines on the east and west edges of the fire and are reinforcing contingency lines if the fire crosses the primary line. Rollout on steep terrain continues to create small uphill runs on the western perimeter of the fire. The area near Santa Ynez peak which burned last night continues to be held in place by water drops and retardant. The southern edge of the fire was quiet as onshore winds kept the fire cool. Near Goleta, ranch roads are being used to establish a fire break above homes and agricultural properties. An onshore breeze continued to create a backing fire on the southern edge of the fire. The eastern and western edges of the fire did burn actively in the late afternoon and evening, notably below Santa Ynez peak. As winds shift, the eastern and southern edges of the fire will become more active. The Whittier Fire is still 48% contained and is now at 12,236 acres burned. Fire activity picked up last night, especially in higher elevations on the east and west flanks of the fire. Last night crews took advantage of the cooler temperatures and used direct attack techniques to continue building a line around the fire. An active area near Santa Ynez Peak burned 400 acres, night flight aircraft were used to cool this area and other active areas of the fire. Today’s weather is expected to transition to warmer, dryer conditions. The marine layer will clear warming the area and lower the relative humidity. A major concern is the forecasted Sundowner winds that could begin Friday evening. The southern edge of the fire above Goleta will see increased air tanker activity today as they continue to apply fire retardant in anticipation of Friday’s forecasted Sundowners. Caltrans and PG&E are working on repairing the highway and the electrical power infrastructure along Highway 154. Two firefighters were injured yesterday, one was from a fall and the other suffered a heat-related injury, both are back working on the line. The marine influence with high humidity is expected to clear bringing higher temperatures and lower relative humidity to the area. Expect an increase in fire activity as the day progresses. East and west edges of the fire are expected to experience an increase in fire activity. The Southern fire perimeter continues to be held by cool onshore winds. The firefighters greatly appreciate that the community wants to make donations of food and items. They want the community to know that they are adequately taken care of and ask that you donate to disaster relief organizations, such as the American Red Cross, local food bank, etc. 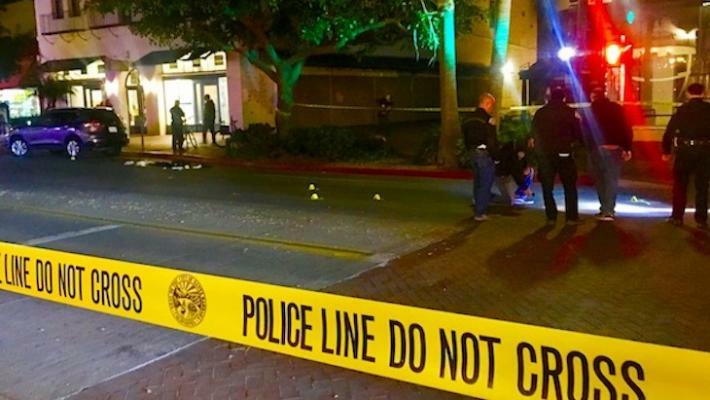 If you are wanting to financially support the incident, please be advised that often individuals take advantage of the situation by setting up false GoFundMe and other types of fundraising accounts that are not legitimate. If you are interested in donating to help in an incident, call and verify that the beneficiary is authentic. In order for fire personnel to have unrestricted access to the site, and for safety reasons, we ask that the public not attempt to reach the incident command post. Thank you for your continued support and concern for those protecting our community during this and future incidents. The Whittier Fire is still 48% contained and is now at 11,920 acres burned. Overnight, the fire activity slowed as cooler temps and higher humidity moved over the fire area. On the east side, three hotshot crews aided by a night-flight helicopter worked overnight to build fireline directly on the fire edge. Crews will continue to build direct lines, reinforce dozer lines and protect the threatened Southern California Edison lines in this area. On the northern fire edge, crews continue to patrol the fireline, and extinguish hot spots. To the west, line has been constructed from Hwy 154 to the rock quarry, but terrain issues are complicating the continuation of that line to the West Camino Ridge, and rollout on steep terrain continues to create small uphill runs. Firefighters are scouting this area, looking for conducive ridges to build fireline. On the Goleta front country, ranch roads are being used to establish a fire break above homes and agricultural properties. Loose rocks, poison oak and steep terrain continues to hamper firefighter safety. The visually dramatic run into Hot Springs Canyon and Bear Creek as slope and wind came together yesterday was expected. Similar weather conditions today will result in additional growth to the east. On-shore winds from the coast will hold the active fire north of West Camino Cielo. Rollout on steep slopes will ignite short uphill runs on the west side of the fire, also creating visual columns of smoke. The Whittier Fire is currently 48% contained with an estimated 11,281 acres burned. Earlier this afternoon the fire made a run up the slope in the Hot Springs Canyon Area caused a large cloud of smoke, but quickly settled down. The weather is going to be cooperative with the fire, with minimal winds and high humidity. The fire is currently within the area of expectation and is expected to die down a bit this evening. Crews continue to reinforce dozer lines east of the fire. On the northern fire edge, crews continue to patrol the fireline, and extinguish hot spots. On the western edge, line has been constructed from Hwy 154 to the rock quarry, but terrain issues are complicating the continuation of that line to the ridge. Rollout on steep terrain continues to create small uphill runs. Firefighters are scouting this area, looking for conducive ridges to build fireline. On the Goleta front country, ranch roads are being used to establish a fire break above homes and agricultural properties. Highway 154 from Armour Ranch (west side) to Paradise Road (east side), West Camino Cielo at Highway 154 to Winchester Gun Club, Kinevan Road are subject to mandatory evacuations. Las Varas Canyon east to Winchester Canyon and from Highway 101 north to West Camino Cielo, Paradise Road from Highway 154 to the first river crossing, Farren Road are currently evacuation warnings. Crews are preparing to begin their 12 hour night operations on the fire. This photo was taken from West Camino Cielo. The Whittier Fire is still estimated to be 25% contained at 10,823 acres. 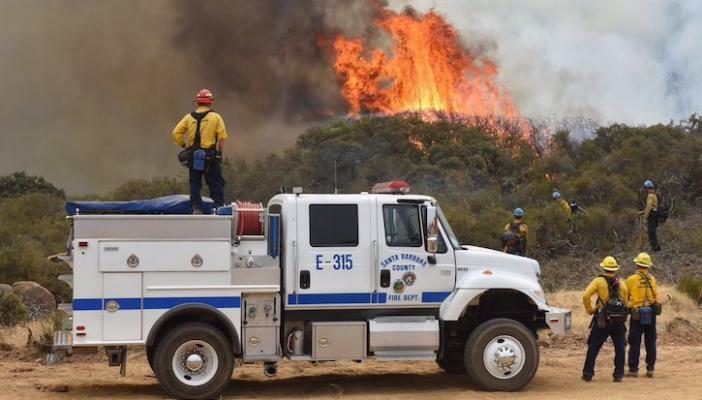 The Los Padres National Forest reports the current weather pattern has allowed firefighters to make good progress. Cooler temperatures and higher relative humidity have moderated fire behavior. Crews have been able to build fireline directly across much of the northern fire edge. 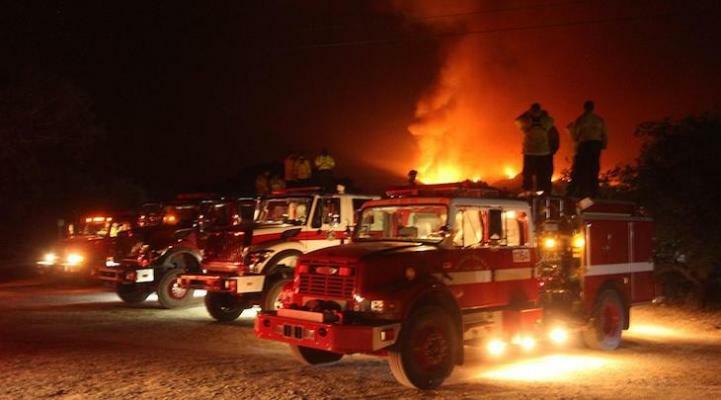 Two spot fires were discovered Monday night on the east side of the fire. Firefighters began suppression efforts on the spots and will continue this effort today. On the western edge line has been constructed from Hwy 154 to the rock quarry but terrain issues are complicating the continuation of that line to the ridge. In the front country ranch roads are being used to establish a fire break above homes and agricultural properties. Effective immediately Farren Road is reduced to an Evacuation Warning. The Whittier Incident fire is now 25% contained at 10,823 acres burned with one new road closure. Salvar Rd at Via Gaitero is closed until further notice for firefighting equipment staging. Today, as the weather pattern shifted back to an onshore flow, smoke from the fire pushed over the burn area into the east Santa Ynez Valley and San Marcos Pass. As smoke shaded the area, fire behavior decreased significantly creating an opportunity for firefighters to build a containment line directly on the fire’s edge. Bulldozers are working the east flank from the Winchester Gun Club toward Hwy. 154. On the west side of the fire, firefighters improved initial firelines and scouted for an area to complete the line up to the Santa Ynez Ridge. Near Lake Cachuma, firefighters were able to declare a portion of the fireline contained. Fire managers continue to work with ranchers and property owners to plan construction of a line along the base of the foothills. The fire has crossed the ridgeline and is backing downslope over Gato, Winchester and Glen Annie Canyons but higher humidity levels have slowed the rate of spread. The evacuations are still in place. The Whittier Incident fire is now at 10,823 acres with still 5% containment. Highway 154 is still closed and mandatory evacuations are still in place. There's now 734 personnel on the scene. 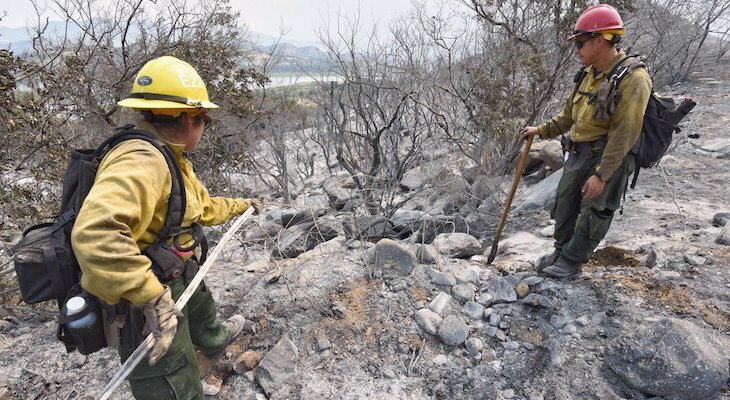 A unified command structure has been established between the Los Padres National Forest, the Santa Barbara County Fire Department, the Santa Barbara County Sheriff’s Department, and CAL FIRE. The fire made a prolonged run to the west yesterday as winds from a collapsing thunderstorm 20 miles away impacted the area. Weather and fuel conditions are a big factor in the decision process relating to the Whittier Fire tactics. Firefighters are attacking the fire directly on the edge of the burn where possible. Where access is dangerous due to the potential of falling trees, difficult terrain or heavy fuels they are taking a more cautious approach and using indirect methods of attack. In the front country, fire managers are working with property owners and planning a fuel break along the base of the foothills. The fire has crossed the ridgeline over Gato, Winchester and Glen Annie Canyons and is slowly backing down the slope. Several helicopters and fixed wing aircraft, including the DC-10 Very Large Air Tanker (VLAT) are assisting with water and retardant drops, reports the Los Padres Forest Service. According to the Los Padres National Forest, the slope that the fire is primarily burning on is comprised of Oak trees and brush that has not burned since the Refugio Fire in 1955. Over the last several years these fuels have been stressed by the exceptional drought conditions and a high percentage of the fuel bed is dead. The combination of old, dry fuels with a newly cured heavy grass crop contributed to the rapid growth of this fire. The weather is expected to be between 80-85 degrees with 30-40% humidity, light and variable winds. Smoke from the Whittier fire will continue to impact air quality along the coast and the Santa Ynez Valley. Road closures, evacuations, and shelter information remain the same. Crews will continue to focus on protecting commercial and residential structures, SoCal Edison (SCE) distribution lines, communications infrastructure, and cultural archeological sites. SCE is closely monitoring the Whittier Fire. The fire appears to be burning away from SCE towers and facilities. If the fire does impact transmission lines, customers in the Santa Barbara area could lose power. SCE has a contingency plan to restore customers but some customers may experience extended outages. SCE has crews in the area and has developed a robust contingency plan to address any potential loss of the transmission lines and will work to reduce the disruption to customers, should the fire impact our facilities in the region. Santa Barbara Captain Dave Zaniboni reports there is very little change to the Whittier Fire as they're keeping the acreage to 7,800 with 5% containment at this time. Zaniboni stated there was some growth to the fire but crews were unable to map it accurately. The fire grew west on the Camino Cielo Ridge and pulled towards Refugio due to winds. Later in the afternoon, it started moving back towards the east. Firefighters were able to make progress on the western Santa Ynez side of the fire, but the eastern edge is growing unchecked due to the steep and inaccessible terrain. Air tankers and helicopters made numerous drops on the ridge and south side of the mountains. No injuries were reported and no other structures were lost today. A briefing will be held Monday at 7:00 a.m. where new information will be released with a more accurate acreage report. The Whittier Fire is still estimated at 7,800 acres and 5% containment. The same mandatory evacuations and warnings are still in place. 3,500 people have been evacuated, mostly from the Lake Cachuma and Camp Whittier area. About 20 structures have been lost or damaged in the fire, most were at the campground area and some at the Lake Cachuma boat dock area. No injuries have been reported. Based on evacuation orders and warnings, a number of people stayed at shelters established by the American Red Cross for the two fires in Santa Barbara County. Last night, 6 individuals stayed at the Red Cross shelter at the Minami Center in Santa Maria, 29 stayed at San Marcos High School in Santa Barbara, and 5 stayed at the Santa Inez Elementary School shelter. In the early morning hours of July 9, a special animal evacuation was made by a Santa Barbara County Animal Control Officer as homeowners were out of town and animals were left in the home. Two schnauzers, Tucker and Cloe, were safely removed from a home in the evacuation area. The dogs were happily reunited with their owners today. Fire behavior currently is being driven by a self-created thermal belt and vegetation, and there are no still no sundowners expected. Resources throughout the state are stretched thin because of the multiple fires burning, but Type 3 brush engines have been deployed to the Whittier Fire, which is well suited for the terrain and conditions of this fire. Helicopters are being used on the south face of the fire. The Whittier Fire is currently estimated at 7,800 acres and 5% contained. A Type 1 Incident Management Team has been requested to manage this fire, and will be arriving today. The incident command post will be at Dos Pueblos High School. So far 20 structures have been destroyed with 150 threatened. No injuries have been reported and an incrase in resources are expected to arrive today. All mandatory evacuations, warnings, and shelter information posted below are the same. For additional, Santa Barbara County residents can call 211, contact the Fire Information Line at 805-895-0841, or visit Santa Barbara County online at countyofsb.org. Highway 154 from Armour Ranch Road on the west to Paradise Road on the east. If you are in this area you are advised to leave immediately. If you are not in this area, avoid the area and Highway 154 entirely. Highway 154 is closed from 246 to Foothill Road. Paradise Road from 154 to the first river crossing. Anyone in this area should be gathering family members, pets, important documents and irreplaceable items and be prepared to leave. People with special needs should evacuate now. Large animals should be evacuated now. The south evacuation shelter is open at San Marcos High School, 4750 Hollister Ave., Goleta. 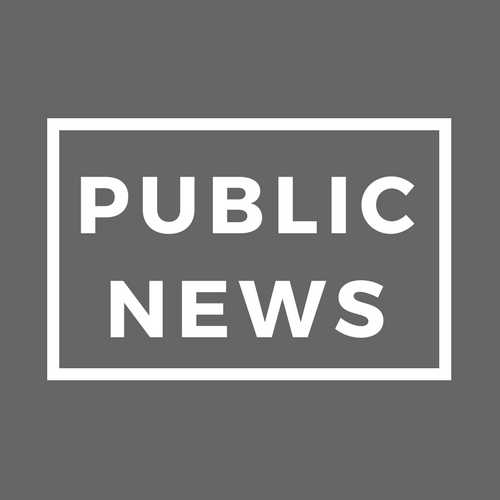 A north evacuation shelter is open at Santa Ynez Elementary, 3325 Pine Street, Santa Ynez. For animal evacuation questions and offers of assistance, call the Animal Services hotline at (805) 681-4332. On the south side, pet owners with small animals that can be evacuated may be brought to the Santa Barbara Humane Society at 5399 Overpass Road, Santa Barbara. Call the hotline for assistance with large animal evacuations. Sheriff’s deputies and Search and Rescue volunteers evacuated Camp Whittier, Lake Cachuma Campground, The Outdoor School at Rancho Alegre, Circle V Ranch, Live Oak Campground and Cachuma Village. 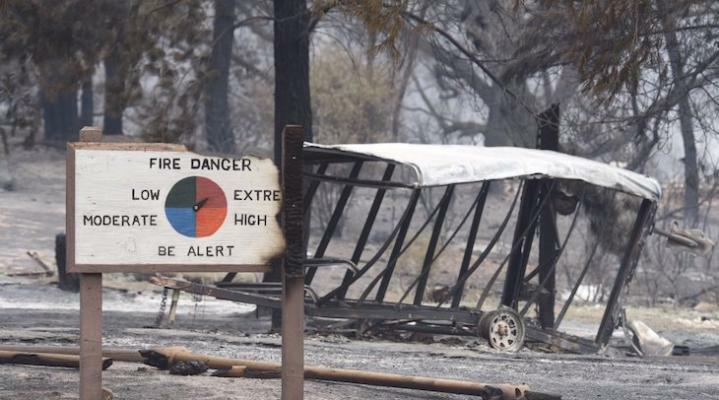 While evacuating Circle V Ranch, the road became inaccessible due to flames and a group of about 63 young campers along with staff members had to shelter in place and were not able to evacuate. First responders stayed with the children and staff until Santa Barbara County Firefighters cleared the fire and made the road accessible again. 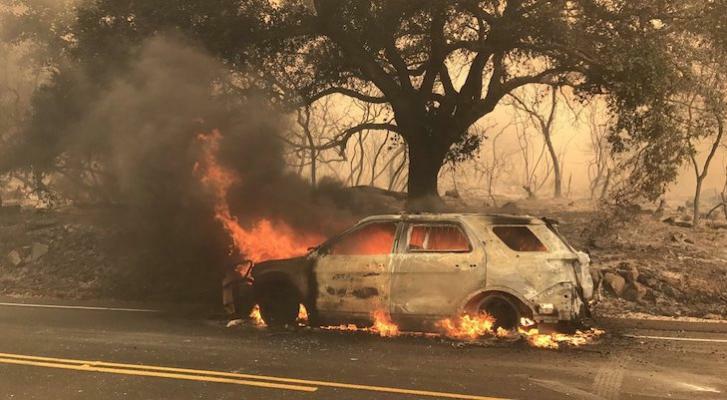 During the process of trying to evacuate children, a patrol car parked along Highway 154 became engulfed in flames and was destroyed. Once the road was clear, Sheriff’s deputies and Santa Barbara County Sheriff’s Search and Rescue volunteers safely transported the children and staff out of the area. They were transferred to two buses provided by the Santa Ynez Band of Chumash Indians. California Highway Patrol led the way and the children were dropped off at the Santa Ynez Mission where they were reunited with family members. As of 8:25 p.m. on Saturday, the Whittier Fire has reached 5,400 acres with 0% containment. The fire now has gone over the ridge above Condor Peak, above Farren Road and Eagle Canyon of West Goleta said Captain Zaniboni. With light wind, the fire has swapped over the front countryside. Crews are hitting the blaze with aircraft as well as a helicopter making water drops throughout the night. Strike teams, bulldozers, aircraft, and hand crew reinforcements will arrive in the morning. The main goal tonight is to keep the fire in check, said Zaniboni. Crews will continue to mop-up and try to gain some containment on the Santa Ynez side of the mountain. The Whittier Fire is now estimated to have burned approximately 3,000 acres with some outbuildings lost at 0% containment. The 80 trapped children camping at Circle V Ranch have been safely evacuated to Old Mission Santa Ines in Solvang where they can be reunited with their parents. The focus for the fire is structure protection and evacuations. The fire continues to burn in an easterly direction with the goal to keep it on this side of the mountain range and not towards Santa Barbara, said Captain Zaniboni. Several air tankers and helicopters are making water and retardent drops in the meantime. Correction on Whittier Fire evacuations. Paradise Road is in an Evacuation Warning only. People on Paradise Road should be prepared to leave immediately. People with special needs should evacuate now. Large animals should be evacuated now. Hwy 154 at Cachuma Lake remains in an evacuation order. If you have large animals to evacuate, contact the hotline: (805)681-4332. The Sheriff's Office has issued a mandatory, immediate evacuation for all of Highway 154 from Armour Ranch Road on the west to Paradise Road on the east and including Paradise Road due to a brush fire that broke out near Camp Whittier and Lake Cachuma today at approximately 1:42 p.m.
An Evacuation Warning has been issued for the area east of Paradise Road to the top of the pass. Anyone in this area should be gathering family members, pets, important documents and irreplaceable items and be prepared to leave. Please do not call 911 or even our non-emergency line if you do not have a critical issue that can not wait. Our Santa Barbara County Public Safety Dispatch Centers are busy handling calls and evacuations. So far Lake Cachuma Campground, Camp Whittier and The Outdoor School at Rancho Alegre have been evacuated. Circle V Ranch, Live Oak Campground and Cachuma Village are in the process of being evacuated. This is a rapidly evolving situation and we will keep you updated as new information becomes available. We will send updated Nixle alerts and post on our Twitter and Facebook page. The latest information will be on www.CountyofSB.org and on County's Twitter and Facebook pages. The Whittier Incident fire is now estimated to be over 500 acres with approximately 80 children trapped in a campground off SR-154. Santa Barbara County Fire Captain Dave Zaniboni stated their main concern is accessing the large group of children at the Circle V Ranch Camp located at 2550 SR-154. Los Padres National Forest Service firefighters are on scene with the children, who are safe and sheltered in place. County firefighters are unable to access the camp through the roadway to get them out safely. Camp Whittier has been evacuated with campers taken to the SR-154 and SR-246 interchange. Lake Cachuma campgrounds are under full mandatory evacuation as well. There were reports of structures that were lost in one camp, assumed to be cabins, said Zaniboni. 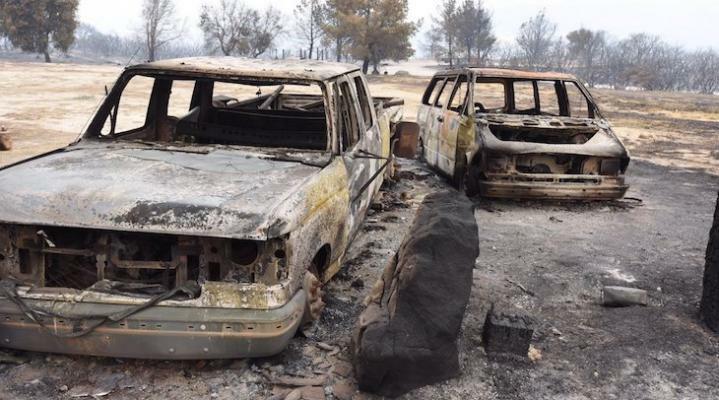 The fire started at 2:00 p.m. on Saturday and the official cause is unknown, although initial CHP reports state it was due to a vehicle fire in the area. I notice that the helicopters have been very active at the Salvar Bridge today. They were less active yesterday. Hopefully today's increased activity means they're knocking down the last of the "smokers" inside the fire perimeter. Various IR satellite heat detections show somewhat recent hotspots on the South fire perimeter directly between the initial start point at Cachuma, and the DP reservoir due South at 101@Langtry Ave. The 1/2 to 1 hour low-res IR sat shows slight heat detection in the fire area. Looks like it's just the "smokers" inside the perimeter stubbornly giving crews a rough time in rugged terrain, so the helicopter drops must be very welcome for them in methodically working toward 100% containment. Also in the noonish InciWeb update: "Improving weather conditions on the south side of the Whittier Fire have created an opportunity for firefighters to safely begin constructing fireline directly on the fire’s edge. " I guess that's why we were hearing the helicopters working out of the Salvar Bridge (101@154) area a while ago. Easier for them to haul water from there, than over the mountains from Santa Ynez Airport. Maybe this work at the fire's edge will mean they won't need to start back fires and we won't have smoke in the air for as long. Thanks, Shasta Guy. They use the names of remote areas as if we all know where they are. If they had used the Gun Club as a reference, I would have known exactly what they were talking about. Thank you to John Wiley!!! It appears the men are currently converting the available heat resource into a maluble tool for future resource management . I saw the update about the eastern flank of the fire being established in Bear Creek. 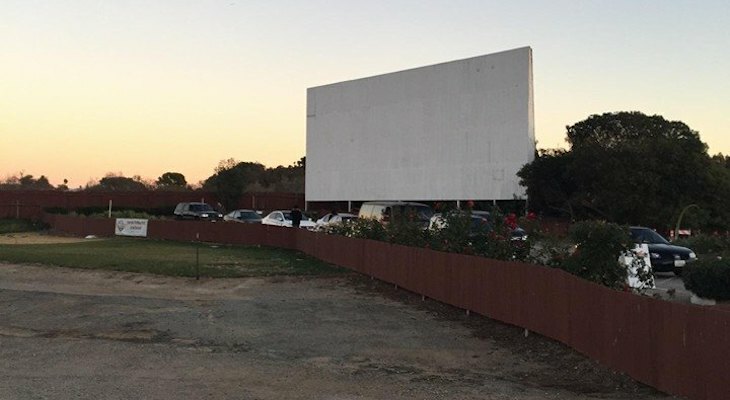 Can someone please tell me where that is? When I tried Googling it I got a location in Lompoc as well as one 7 miles from Goleta. I live in West Goleta, so I would like to know just where this part of the fire is. Thank you. fire is 7 west of you you ARE safe for the night. sware to it. 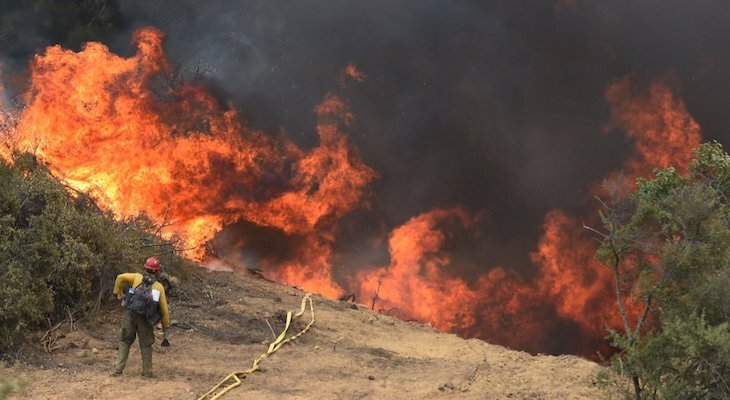 On this one Edhat thread alone “Whittier Fire Increases to 36% Containment”, there are 93 comments and 115,480 reads, as of 5pm, Sunday, July 16. There are 747 paid subscribers, which is nearing an all time high (I think it got up to 800 paid at some point about 4 years ago?). It's great to support each other during the Whittier Fire. Nobody is alone when Edhat is at its best! Please County of Santa Barbara, livestream and put on a website the videos of all updates done at Dos Pueblos H.S. That way, we wouldn't have to depend on the various news outlets, and others, to interpret what's happening with the Whittier Fire. Public Information Officers, as well as interacting with media, and taking photographs, could "go direct" to the public, in real time. And, those evacuated cold look at the briefing on Sunday morning (was there one? ), when no other news is apparent. Photo-document for Edhatters, please. If you see a firetruck from another state or county, snap a photo and send it to Edhat. Do a video about your evacuation experiece and post it on Edhat. 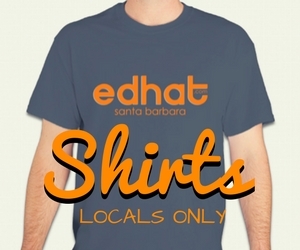 Send photos or videos to: ed@edhat.com. There are homebound people, because of the fire, or health, and they would appreciate your vision of the events (not only flames and smoke) surrounding the Whittier Fire. If you see something, photo (say) something. Thanks! Thank you for your ongoing work! MountainMan thanks for the update on the ridge cam. Bad news when the fire's acting up. Looked to me like someone had cleaned the PhosChek off last night too. :( We just flew around the fire so by 6pm or so I'll hopefully be posting pix to SBitZ.NET and sending some to Ed. Fantastic photos, Sir! They give a really good perspective, and looking at them, it gives me hope that things are quieting down. The winds have yet to show this evening... even better! Thank you. Gawd... didn't even notice the Phoscheck was gone. Sigh. Fire fatigue. If you fly by Painted Cave, we'll be sure to come out and wave! Of course you've got the Skycranes to dodge. If I thought I could motivate to clean the windows, I'd put a camera up to stream the helicopters going back and forth. Santa Ynez Peak, http://hpwren.ucsd.edu/cameras/wide-c.html scroll down, click on any of four to see enlarged photo, refreshes every couple minutes. 360 degree view of Whittier Fire from Santa Ynez Peak, four directions. Current, real time within 2 minutes. Get a life SwarfMaster. And get off this thread. I want to commend and thank the County of Santa Barbara and the Fire Department for providing THREE phone numbers for people to call to get answers about the Whittier Fire. Bravissimo! Two additional phone lines were added last night to the (805) 699-6451, they are: (805) 562-1236, (805) 562-1237. I've just posted some info gathered online from various sources, onto SBitZ.NET including a rough map of what I guess is the new evacuation area described in the Friday night update. (805)699-6451 Whittier Fire Information. Open 7am-until at least 10pm (including this weekend). A real live fire department (Captain?) person answers the phone, and answers questions. Hoorah, you can always get an update! KEYT will broadcast an Whittier Fire update News Conference at 2pm live today. They also have a LIVE CAM for live streaming: https://www.youtube.com/user/KEYTKCOYKKFXNews. The most recent streaming was last night, Tracy Lehr from Rancho Dos Pueblos area. Very interesting, Tracy! She mentioned watching the KEYT live streaming on Youtube and Periscope. Can someone explain how to use Periscope? KEYT please broadcast Youtube live streaming this weekend, Saturday and Sunday. And, please announce WHEN you will be live streaming, otherwise it’s just a Youtube video. I really enjoyed your live streaming broadcasts on Youtube when I've stumbled across it live! Can Edhatters livestream to the comments section of Edhat (John Wiley, MountainMan can you?). Does anyone know why there is virtually no air support first thing in the morning? Living where we do, in the foothills of Goleta, I've had a front row seat to enough wildfire fires to understand that fires aren't generally "put out" from the air, but rather by the ground crews. Having said that, we've been lucky with cool overnight temps and high humidity on the front country all week. Each morning the flames and smoke are minimal. Isn't this an ideal time for a direct attack on strategic areas of the fire? - Or is the fireline on the front slope in terrain too steep for a direct air attack? - Resource limitations? - Budget limitations? - Management decision? So it was intentional? If not, you don't jail people for their entire lives for being negligent. Also, it may have been a no-fault accident. That does happen. Stop being so quick to find blame. Instead, be prepared and vigilant and safe. Focus on the important things now. Why are the comments all out of order?? Gah! It seized up just as he started talking about the front side. Hopefully others will have better luck. I just stumbled across this! Yay! It's about 2 hours old right now. It's the closest thing to an update I could find. https://www.pscp.tv/LosPadresNF/1YpKkmyAowrJj It's their fire behavior analyst. Post what you know/see/hear about the Whittier fire. If you see something, SAY something on Edhat. Post good maps of the fire boundary, ESPECIALLY front country. Maps of the existing burn areas containing two indicators, (1) new burn (2) overlaid depiction of the direction in which fire front is advancing. Also, if power goes out, where do you turn to for information? emergency radio, w/batteries or hand-cranked. I haven't bought one yet either. 13,000 views with only 300 people subscribing! What a cheap lot you readers are. Airport/Goleta tomorrow night, Thursday, winds overnight west-northwest. That will bring smoke into Santa Barbara. Hopefully, the Whittier Fire won't march down the hill. Much warmer this weekend. It's time to invest in an air purifier with HEPA filter. Keep it running in one room and door shut for "safe room". FROM S.B. County Health Dept. -----https://www.edhat.com/news/air-quality-warning-re-issued (July 10) "If you are particularly sensitive to air pollution, and air quality is poor in your area to the extent that you are unable to keep indoor air clean, consider relocating to an area where the air is cleaner." ------"Even as conditions improve, winds can still stir up ash. Over time, those particles can be broken into smaller particles and blown into the air. Residents are urged to avoid using leaf blowers or doing any activities that will stir ash and particles into the air. Instead, sweep ash gently with a broom, and take cars to a car wash. You should avoid skin contact with ash…"-----"The Santa Barbara County Public Health Department and the Santa Barbara County Air Pollution Control District re-issued the Air Quality Warning due to continued smoke and ash impacts from the Alamo and Whittier fires. The Air Quality Warning will remain in effect until conditions improve." Thank you so much John Wiley, Macpuzel and Mountainman. That does make sense. Bless you Mr. Wiley! I've been searching for a ridge line photo for reference. Yours helped a lot!! We went up to the point and took some pictures, and felt a lot better about the situation now that we have a better idea of where the flare up is. We've been under dark red sky, raining ash and a parade of helicopters for at least 5 hours. MFitch - I agree with Mr. Wiley's assessment. There were several isolated thunderstorms yesterday morning to early afternoon. One could be over Cuyama and look like it was just on the other side of the mountain. I am so thankful for our little community! Will post pictures from the point here in a few. The fire has flared up on the North side of the mountains, and I've posted updates including pix and a video on SBitZ.NET for anyone interested. They're staging helicopters at the East end of Salvar Bridge (154 at Foothill), and there's a crowd gathering to watch. I posted in the hope of helping people get info without possibly adding to the workload (and danger for everyone) of the support crews working there. Thank you Ed Hat. For beating the county of Santa Barbara as a source of information for residents effected in an emergency situation! !